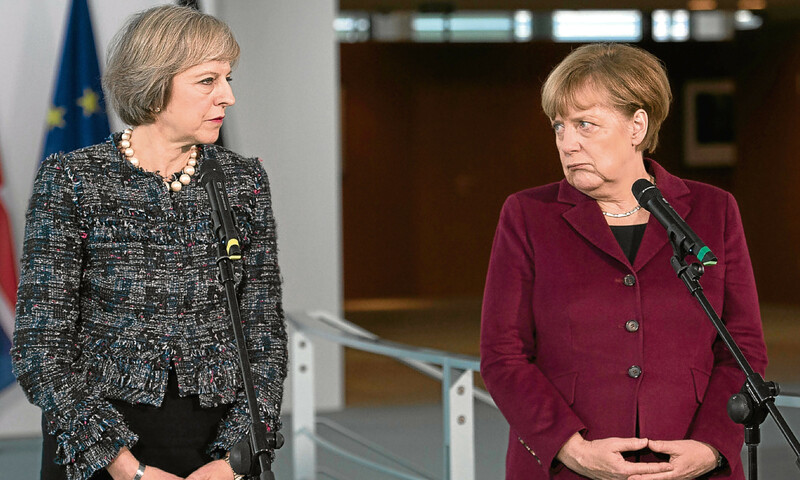 Prime Minister Theresa May, pictured with German Chancellor Angela Merkel, seems to have moved right in her European views. But, in fact, both are completely beholden to the rank and file of their respective parties, which renders them unable to make a clear headed argument on the subject of Europe. May, who we think started out as a “remainer”, has sought to cement her new-found power by appeasing only the “leavers” among her fellow Tories. Her latest views on Brexit, expressed in a television interview on Sunday, suggest she has ruled out any soft options on staying within the single market and allowing the free movement of people across borders. This looks like a no-going-back shift to the right, apparently motivated by her desire to keep in with the anti-immigration zealots in the Conservative Party. It is not a move a leader with real authority would have taken at this stage, with public feelings still raw over Britain abruptly abandoning its European membership. Are these May’s true sentiments or is she trying too hard to please? We can’t blame Sturgeon if she also hardens her tone in response to the Prime Minister’s rightwards lurch – it would be strange if the SNP leader didn’t rise to the bait. She must be secretly thrilled now that the “right wing Conservative” beast of Nationalist folklore has supplanted the far too amenable Cameron and given her much-needed ammunition in her independence battle. But Sturgeon, too, is a leader under the thumb of her party. Though she might sound magisterial in BBC set pieces, she cannot take a step without considering the mood of her separatist mob. They put her where she is and she seems to be a puppet to their demands, whatever her own political instincts. Take her dithering last week. First she offered to postpone any new independence referendum in exchange for a soft Brexit, a definite retreat from her insistence in June that a second ballot was “highly likely’. She used words such as “compromise” and “consensus” and for a minute even the cynics among us were at risk of being won over by this unrecognisable stateswoman. But between then and Sunday, the Nationalist thought police must have got to her because she was suddenly back on message, telling Andrew Marr her referendum threat over Brexit was not a bluff. In more familiar defiant mode, Sturgeon said a referendum would happen soon, if not this year then possibly within two years, if Scotland “was driven off a hard Brexit cliff” by UK ministers. If it was up to many in her party, there would be a referendum tomorrow, she admitted. There should be no mistaking what this means. While May flounders over the direction of Brexit it is easy for Sturgeon to appear emollient, especially to observers beyond Scotland who are less accustomed to Nationalist cunning. The First Minister says she wants a “practical discussion” and is prepared to meet May’s government “half-way” to secure an EU accord but in truth, she will do nothing of the sort. What would Sturgeon regard as a compromise? She is pinning everything on Scotland retaining access to the single market and a customs union; these are her red line issues. But as the grounds on which she wants to make a separate deal have already been ruled out by other member states because Scotland is not a sovereign country, she knows there will be no compromise – and therefore she can carry out her threat to hold another referendum. Her negotiating position is not negotiable and Scots need to be made aware that she isn’t seeking a soft or hard Brexit from Europe, just her usual – separation from the UK. The problem for Sturgeon is that in six months of campaigning for such an outcome, support for separation has, if anything, weakened. Hopes that Europe would galvanise “shy” Yes voters have not materialised, quite the opposite. There is the added obstacle of a rather sizeable Nationalist preference for exiting Europe, articulated so far by a handful of SNP veterans. Another source of confusion for the Nationalists, and voters, is that the Scottish Tory leader, Ruth Davidson, is a soft Brexiteer, closer to Sturgeon’s stated position on Europe than to Theresa May’s. What a powerful case Davidson and Sturgeon could make together for a specifically Scottish resolution to the European dilemma, with regional quotas for European workers perhaps, and separate Scottish fisheries and farming agreements. But that would involve two prerequisites: the burying of political hatchets – and are either capable of that? And, impossible for Sturgeon, breaking it to her Nationalist activists that this is all about Britain’s place in Europe and not about Scotland’s place in Britain.